When Charlie Chaplin was criticized, it was for his direction, especially in the seemingly lethargic later movies. When I criticize Dylan now, it's not for his abilities as a singer or songwriter, which are extraordinary, but for his shortcomings as a record maker. Part of me believes that the completed record is the final measure of a pop musician's accomplishment, just as the completed film is the final measure of a film artist's accomplishments. It doesn't matter how an artist gets there -- Robert Johnson, Woody Guthrie (and Dylan himself upon occasion) did it with just a voice, a song and a guitar, while Phil Spector did it with orchestras, studios and borrowed voices. But I don't believe that by the normal criteria for judging records -- the mixture of sound playing, singing and words -- that Dylan has gotten there often enough or consistently enough. It didn't matter that Charlie Chaplin may not have been a great director or a great anything else. He made great movies. But it does matter whether or not the sum total of Dylan's talents has added up to the making of great records. By and large I don't believe that they have and, if the unit of rock & roll art were only what survives on vinyl, exclusive of anything else and undivided into its component parts, then I don't believe that Bob Dylan would qualify as a great rock artist. If Dylan isn't a great rock artist per se, his is a great artist, period. He has transcended his limitations more successfully than anyone else in rock. He succeeded in making himself indispensable. The records may be indispensable in only the first moments in which they are perceived, but they can transmit as much force in those moments as others do in hours, days and years. Much of the critical enthusiasm for Blood on the Tracks is really a sigh of relief that he's shaken off the role of contentment that never rang true. But in returning to his role as disturber of the peace, Dylan hasn't revived any specific phase from the past, only a style that lets his emotions speak more freely and the state of mind in which he no longer denies the fires that are still raging within him and us. He is using elements of his past to make an album about his past. The record itself has been made with typical shoddiness. The accompanying musicians have never sounded more indifferent. The sound is generally no more than what Greil Marcus calls "functional," a neutral environment from which Dylan emerges. But the singing is much better than on any recent album. He turns up with beautiful phrasing on "Tangled Up in Blue," "You're a Big Girl Now," "Shelter from the Storm" and "Buckets of Rain" (but the snarl he resurrects from "Like a Rolling Stone" in order to sing "Idiot Wind" sounds like a shadow of his former self). The writing is the source of the record's power. It's been a long time since Dylan has composed a melody line as perfectly suited to his voice as "Tangled Up in Blue," and though the lyrics are both confessional and narrative, Dylan makes it all sound like direct address. There are times when he sounds closer, more intimate and more real than anyone else. If in Dylan's world of extremes there's room for a middle ground, that's where I place Blood on the Tracks. It's his best album since Blonde on Blonde, but not nearly as good. If it contains nothing so bad as the second version of "Forever Young," only "Tangled Up in Blue" comes even close to "One of Us Must Know (Sooner or Later)." To compare the new album to Blonde on Blonde at all is to imply that people will treasure it as deeply and for as long. They won't. But, for the moment, which is when this record was made for, I like everything about it; the good, the bad and the ugly. It all matters: the title "Tangled Up in Blue"; and the way that song propels itself relentlessly forward (even though it is about the past) and always winds up leaving Dylan and us standing in the same place; the lines, "I helped her out of a jam, I guess/But I used a little too much force"; the way that song sounds so right for the Byrds of 1965; the compassion, not rage, of "You're a Big Girl Now"; the lines "I can make it through/You can make it too"; the innocence and unqualified beauty of Dylan's reprise of his folk music roots on "Buckets of Rain"; the awkwardness of the music for "If You See Her, Say Hello"; the childishness (without any redeeming childlike wonder) of so much of "Idiot Wind"; the holiness of the last verse of "Shelter from the Storm"; the extension of the apocalyptic mood of his earlier work into something still forceful, but mellower, more understanding, more tolerant and more self-critical; the indifference to the subject of women as a generality and his involvement with women and love as something specific, and above all, the arrogance -- that defiant indifference to whatever it is others think he ought to be doing. He still stands alone. Blood on the Tracks will only sound like a great album for a while. Like most of Dylan, it is impermanent. But like the man who made it, the album answers to no one and was made for everyone. It is the work of someone who is not just seeing through himself, but looking through us -- and still making us see things that we haven't seen before. - Jon Landau, Rolling Stone, 3/13/75. Dylan's return to Columbia is marked by what is probably his best LP in five years, mixing the vocal styles of the "Mr. Tambourine Man" and "John Wesley Harding" days with reasonably simple instrumental backing and material that stands as poetry as well as songs. A number of love and story songs highlight the LP, ranging from the raspy, jump Dylan that is familiar to all, to some smooth ballads. Subject matter varies from some superb love songs to some fine narratives. All the songs, however, are of a very powerful nature. Like the best of previous LPs there is an underlying sense of tension that makes the listener quite aware he is hearing something other than your average singer but does nothing to interfere with the enjoyment of the album. Other songs include some country oriented things and some of the AAB blues Dylan has always done so well. There's even an 8-minute cut that is not a "Desolation Row" but is quite enjoyable. If you're looking for deep meanings in this LP, they are more than likely there. If not, simply enjoy the album. Best cuts: "Tangled Up In Blue," "Simple Twist Of Fate," "Idiot Wind," "Lily, Rosemary And The Jack Of Hearts," "If You See Her, Say Hello," "Shelter From The Storm," "Buckets Of Rain." Dylan's "soulful, bounding leap" into the world of memory and pain. The Jack of Broken Hearts, tangled up in blue (love as allusion, the Seventies as illusion), arriving at the haunting and haunted realization of "Simple Twist of Fate." - Jonathan Cott, Rolling Stone, 12/15/77. Blood on these tracks, indeed. " Blood on the Tracks remains the most scarifyingly acute dissection of marital breakdown ever committed to vinyl," writes Niall Stokes of this Dylan number one. "It is a monumental achievement, cinematic in scope and epic in its proportions. There isn't a weak moment and in 'Idiot Wind,' 'Lily, Rosemary and the Jack of Hearts' and, in particular, 'Tangled Up in Blue,' Bob Dylan redefines the potential of the popular song. "Dylan is capable of making you laugh, of transfixing you with his anger, of filling you with awe at the resourcefulness of his language, at the originality of his imagery. Blood on the Tracks, a magnificently titled record, does all of these and more. It chills me to the marrow, makes me cry and makes me feel absurdly good at the same time. Ultimately the sheer quality of art, the mastery of the medium, the magic of the music is a supremely uplifting experience." Stokes writes eloquently of this masterpiece. Pete Hamill need not be asked for further comment, since his liner notes on the back cover were so lengthy they had to be reproduced in tiny print. He won the 1975 Annotator's Grammy for his efforts, which were removed from and then restored to the jacket, creating two different versions of Blood on the Tracks. In 1987, Blood on the Tracks was chosen by a panel of rock critics and music broadcasters as the #25 rock album of all time. Planet Waves was recorded after the expiry of Dylan's initial contract with CBS but he returned to the label to record Blood on the Tracks which taps a reservoir of vitriol and bile, the backlog of bitterness from his broken marriage to Sara Lowndes. The inspiration may be negative but the album marks a return to form and a shift away from the soft-centered, though both content and delivery are a little relentless. Again, as with Highway 61 Revisited, the CD issue lacks the expected directness and immediacy sounding much like an excellent copy of a second rate copy master tape. The natural edge is missing from Dylan's voice and though well recorded, well separated, the overall sound is slightly veiled ("You're Gonna Make Me Lonesome" etc. suffers particularly). "Jack O'Hearts" shines through though even here Dylan's voice seems limited and rolled-off in recording. Compact Disc however brings the benefit of a deeper bass. - Pete Howard, Musichound Rock: The Essential Album Guide, 1996. Among Dylan fans, Blood on the Tracks has a reputation as "the divorce album." (It was, in fact, written and recorded while Dylan was still married to first wife Sara Lowndes -- which may mean that cause and effect have been reckoned exactly backward.) It is a work that is steeped in raw-throated, searing loss. Love is everywhere in these songs but seldom in the present. It drifts on the currents of the past, to wash inexorably on the shores of the present. The album can make you feel morbidly good about feeling bad. Not surprisingly, it is the perfect soundtrack to a breakup. Its particular brand of sadness primes the wounded heart for another giddy flight -- and for another exquisite spiral earthward. 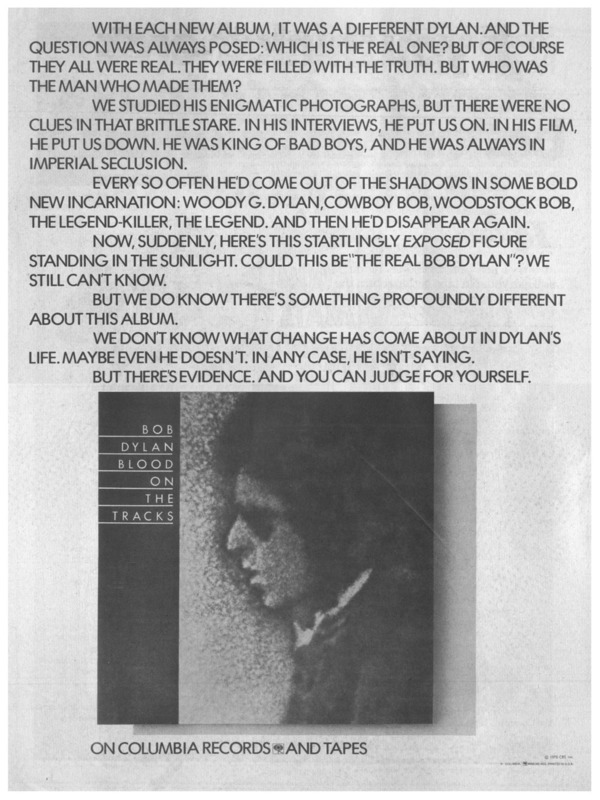 It's an album that transforms the soul's cruelest tortures into magnificent art, and that's the sort of thing that can set you out in search of "a Dylan girl" (my idea of a tall, shapely woman who manages to exemplify the essentially bittersweet character of love) however bad an idea that is in practice. Blood on the Tracks was voted the 29th greatest album of all time in a VH1 poll of over 700 musicians, songwriters, disc jockeys, radio programmers, and critics in 2003. - Eric Wybenga, VH1's 100 Greatest Albums, 2003. Bob Dylan once introduced this album's opening song, "Tangled Up in Blue," onstage as taking him ten years to live and two years to write. It was, for him, a pointed reference to the personal crisis -- the collapse of his marriage to Sara Lowndes -- that at least partly inspired the album, Dylan's best of the 1970s. In fact, he wrote all of these lyrically piercing, gingerly majestic folk-pop songs in two months, in mid-1974. He was so proud of them that he privately auditioned almost all of the album, from start to finish, for pals and peers including Mike Bloomfield, David Crosby and Graham Nash before cutting them in September -- in just a week with members of the bluegrass band Deliverance. But in December, Dylan played the record for his brother David in Minneapolis, who suggested recutting some songs with local musicians. The final Blood was a mix of New York and Minneapolis tapes; Dylanologists still debate the merits of the two sessions. Yet no one disputes the album's luxuriant tangle of guitars, the gritty directness in Dylan's voice and the magnificent confessional force of his writing: in the existentialist jewel "Simple Twist of Fate," the wrung-dry goodbye of "If You See Her, Say Hello" and the sharp-tongued opprobrium of "Idiot Wind," his greatest put-down song since "Like a Rolling Stone." Blood on the Tracks was chosen as the 16th greatest album of all time by the editors of Rolling Stone magazine in Dec. 2003. An intensely touching album from an artist at the height of his powers, Blood On The Tracks is essentially about a marriage breakdown, in this case that of Dylan's own to his wife, Sara. Songs such as "You're Gonna Make Me Lonesome When You Go," "You're A Big Girl" and "If You See Her Say Hello" speak for themselves in terms of lamenting regret and love lost, while "Buckets Of Rain" is a bittersweet love song. Throughout the album the perfect cadence of Dylan's poetry barely disguise his rage -- anger that really comes to the fore in songs such as "Idiot Wind." Dylan also manages to weave examples of his trademark epic folk stories into his songs, as evidenced on the relatively upbeat "Lily, Rosemary & The Jack Of Hearts." The album is also notable for having been almost completed over a series of recording sessions that were subsequently scrapped by Dylan in favour of re-recording with a different group of backing musicians. Blood On The Tracks topped the US charts and managed a Number Four placing in the UK, in the "Tangled Up In Blue" it also gave Dylan his biggest US single hit since "Knockin' On Heaven's Door," two years earlier. As of 2004, Blood On The Tracks was the #96 best-selling album of the 70s. The wordy whining, the wheezy harmonica -- we won't lie to you, they're here. But so too are some of the brightest songs in a career not short of sparklers. The omens were not brilliant. Dylan spent the early 1970s making scrappy records ( Planet Waves ? Yes, please. Pat Garrett And Billy The Kid ? No, thanks), leaping from label to label and generally suggesting that he was not adapting too well to the new decade. To complete the chorus, his marriage was unraveling. You could expect only maudlin musings on love lost. Instead, you get the lovely "Tangled Up In Blue" (even the title is fantastic), the sneering "Idiot Wind" (you're an eeeediot, babe"), the beautiful "Simple Twist Of Fate," and the breathless "Lily, Rosemary And The Jack Of Hearts," which drags not once in a running time of nearly nine minutes. "Shelter From The Storm" is an expression of gratitude that any world-oppressed, beleaguered male will understand. The music touches on blues, folk, and proto-Dire Straitisms without dwelling on any style long enough for its appeal to pall. This diversity is due in part to Dylan having revamped the album after a test pressing was issued in November 1974 (making that Christmas the best ever for bootleggers). Unsatisfied with recordings made in New York, he re-cut "Tangled Up In Blue," "You're A Big Girl Now," "Idiot Wind," "Lily, Rosemary And The Jack Of Hearts," and "If You See Her, Say Hello" with musicians in his native Minnesota -- resultng in his second consecutive U.S. No. 1. If you listen to only one Dylan album, or you want something to blame for Dire Straits, this is it. - Bruno MacDonald, 1001 Albums You Must Hear Before You Die, 2005. Shortly after initial test pressings of this album began to circulate in November 1974, Bob Dylan had a change of heart. The sessions, which took place in New York in September, had been arranged quickly, and in characteristic fashion, Dylan gave the musicians (from Eric Weissberg's band, Deliverance) little instruction. The singer and songwriter expected them to simply follow what he was doing. Listening to the results, Dylan decided that several of the key songs -- including "Tangled Up in Blue," "Idiot Wind" -- needed more. He hastily assembled a band in his native Minnesota, and over two days in late December recorded versions that were more to his liking. The originals became a bootlegger's bonanza -- a few of them were eventually released on Volume 3 of the authorized Bootleg Series. 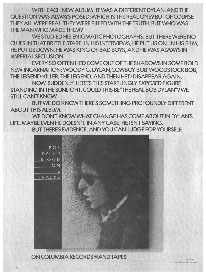 Meanwhile, the sleeve notes printed at the time of the initial pressings refer to several lines that Dylan excised in rerecording. There's nothing wrong with the originals, of course. These songs of disillusionment, many inspired by the rocky end of Dylan's marriage to Sara Lownds, are sturdy enough to withstand all sorts of interpretation. But in the rerecording, Dylan summons a raw, overtly wounded tone that magnifies the feeling behind the words; there's no misunderstanding the vulnerability that saturates "Tangled Up in Blue," or the veiled fondness behind "If You See Her, Say Hello." And really, the slightly desperate shouts of the Minnesota versions help make Blood on the Tracks an ultimate breakup album. Though it's filled with allegories and cryptic riddles, somehow the basic plotline -- she's gone, he's overcome with sadness -- is inescapable. Virtually everything has that energy: The nine-minute odyssey "Lily, Rosemary, and the Jack of Hearts" and the feral rant "Idiot Wind" form an eerie self-portrait of a man who's been blindsided, knocked flat by that "Simple Twist of Fate," and is gradually beginning to apprehend where, exactly, he stands. Supposedly inspired by the collapse of his marriage, Dylan's 15th album is a mellow-dude detonation of anger, regret, and acceptance that features some of his most soulful singing and enduring melodies. "It's hard for me to relate to... people enjoying that type of pain," he later said in an interview. But it's harder to imagine anyone not geting swept up in this masterpiece of deeply emotional songwriting. Blood on the Tracks was chosen as the 6th greatest album of all time by the editors of Entertainment Weekly in July 2013.